With plastic connection corners and 90o cutting of the profile, for quick and easy assembly, they are the perfect solution for small (and even large) windows, where there is no need for an opening screen. 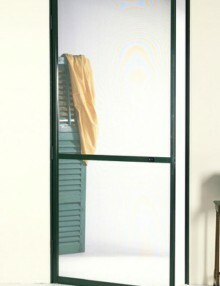 By adding a crossbar to the fixed frame, you may easily assembly fixed frames for large openings. The mesh is made of “soft” fiberglass that does not decay or burn and is so elastic that may stretch perfectly on the door offering an attractive aesthetic effect. Alternatively, an aluminum screen or a “pet-screen” made of extremely resistant fiberglass may be used, which resists insects as well as the nails of your pet. The installation is extremely easy, while the possibility to add a brush or a magnet on the fixed frame profile facilitates the montage on any unusual construction you might want to build. 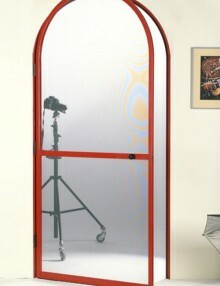 The Gioconda system is a revolutionary new model of vertical motion screens. The use of non-combustible and extremely high tenacity polypropylene pleated insect screen offers excellent antikonopiki protection and shading . The cables of Kevlar , intermediate in cloth , provide unrestricted air resistance and the frequent daily use . There is spring-loaded , making the opening or closing easy even children or elderly. Stops at any point to leave . 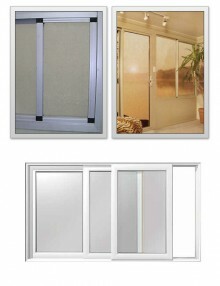 It allows us to cover large windows doors with a maximum height of 2 meters and 50 centimeters . The “Free” insect screen functions with a caterpillar without bottom guide! It does not gather water and dirt, not dangerous for tripping on it! 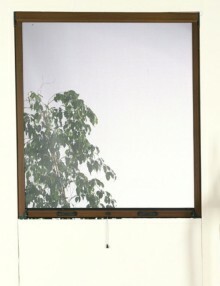 The “Free” insect screen gives a solution to the dangerous unpredictable opening of the screen (prohibited by EC directives) as it stops at any point leaved. The caterpillar forces the insect screen “Free” to work always parallel to the wall, not allowing the mesh to roll wryly or to get creased and even ripped! 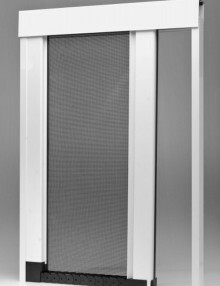 The “Free” insect screen is manufactured with quality Fiberglass mesh; a material that will not corrode or burned (fulfills all the specifications of fire safety)! American type opening screens with automatic return and magnetic closer. 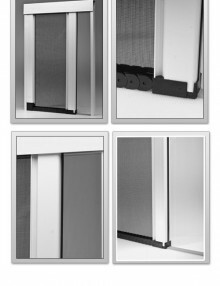 Made of reinforced aluminum profiles, they are ideal for front doors. Easy montage with plastic connecting corners for 90o cutting or molten aluminum connecting corners for 45o cutting of the profiles. Available with exposed rubbers for easy screen replacement or with special clasping aluminum profile that hides the rubbers. The mesh is made of «soft» fiberglass that does not decay and is so elastic that may be perfectly stretched on the sash of the door and provides an attractive aesthetical effect. The possibility to add panels at the lower part of the door or a larger crossbar in the middle facilitates their use even by children or elderly. The adjustable hinges provide extremely easy installation, as well as removal for storing during the winter months. 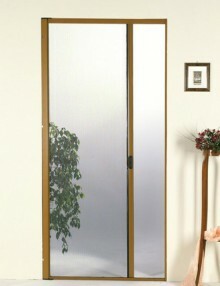 Single or double leaf screens are ideal for sliding doors and windows. 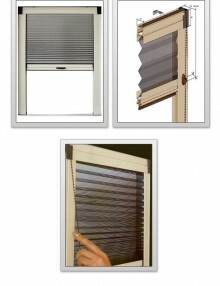 The installation is very easy as well as the removal for storing during the winter months. They may be installed into all kinds of window or door frames. 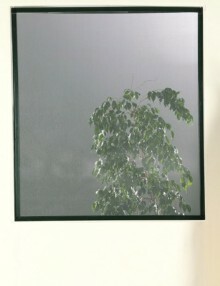 Offering maximum height up to 2 m and 55 cm for vertically moving screens, maximum width up to 3 m for horizontally moving screens and minimum required space of just 33 mm between the frame and the roller shatter, the wide spectrum of Belco Systems insect screens supplies you with the perfect solution for any type of door or window. guaranty the smooth operation and durability of our insect screens regardless of the weather conditions. The “Mesh Lock” brush ensures extra durability to wind strains. The “adjustable speed controller” of the spring allows you to adjust the screen rolling up speed. The adjoining profile above the case of the vertical system facilitates the installation of the screen outside of the window when we have a shutter that locks with a hook. 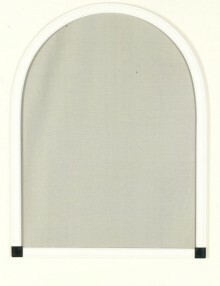 The “wedge” stopper blocks the horizontal screen at any desirable intermediate point. Easy and safe shutting with magnet or hook.